"Mary and I set out to locate D14 on the Upper Iowa River down stream from Bluffton, Iowa. We were getting a strong signal with the PTT receiver as we came down into the valley near what is called the Hutchinson Bridge. As we drove over the old bridge, D14 flushed from its upper beams. He flew to a nearby tree and we were able to get some pictures. Mary and I then met with Dixie Hutchinson to show her where D14 has been on their river property. The land owner from across the river joined us just as a team of horses pulling a large wagon and making lots of noise with their hoofs caused D14 to take flight once again. We were surprised to see him join another immature eagle (D13?) in the air. He broke off and returned to land on the upper beams of the old bridge. All of us could easily see his transmitter." We believe that D1 remains in Polar Bear Park, but have not had an update for five days. Her transmitter is solar-powered, so it is possible that grey, rainy weather has prevented the battery from charging. I'll post new coordinates as soon as we get some. 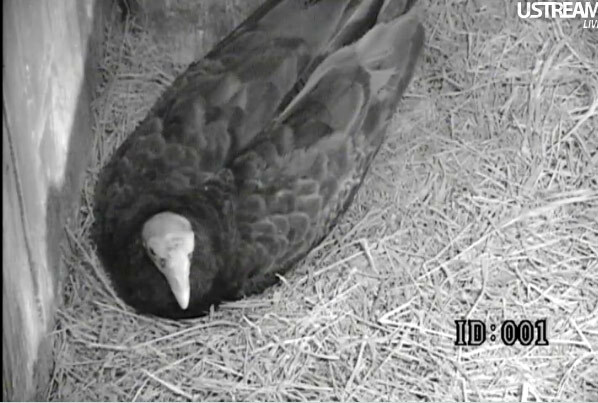 The first Turkey vulture (BB) fledged yesterday at about 10:27am. We have a Ustream video highlight here: http://ustre.am/_1GOFB:1cZn. As of this post, LB is still in the barn. I've had some questions about whether or not the TV will return to the barn after they have fledged. I don't know, but have asked for a ground update. I'll post when I get it. For the next two weeks, we will be testing equipment, building kestrel nest boxes, and installing a Peregrine nest box at a cliff in Bellevue, Iowa. 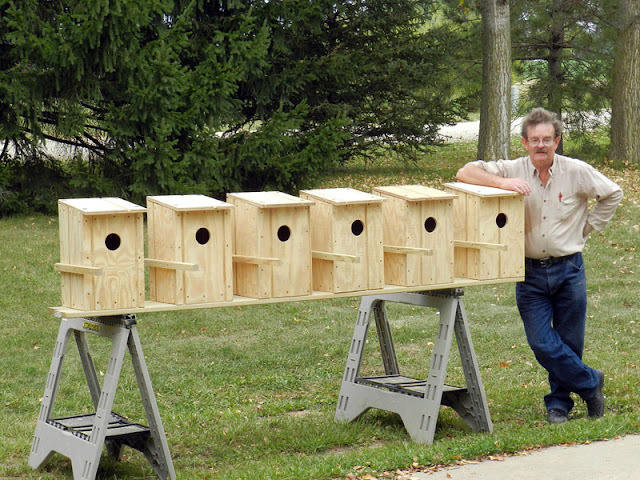 Once we have plans drawn up for the kestrel boxes, I'll post them as well. Happy birding, online and off! Some people enjoy watching the little Turkey vultures and others do not. The TVs behave quite differently from the eaglets: they spend hours a day beating each other up, don't play in a similar fashion, appear to frighten their parents (the hooligans! ), and have a very unappealing diet. They are fun to watch (if you don't mind intestinal tug-of-war) but there are not nearly as many 'awwwwwwhhh' moments. 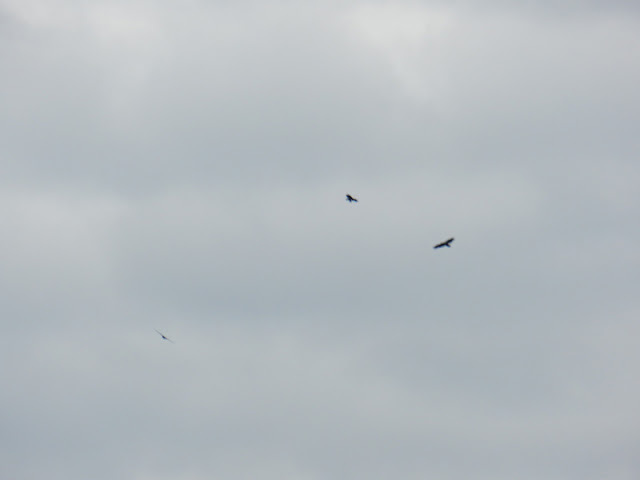 Both Bald eagles and Turkey vultures are raptors [note - I had a few of emails that pointed out this is debatable. Some experts argue that New World vultures should be placed into storks, others argue they should have their own order, Cathartiformes, and still others argue that they should be placed into raptors]. So why are their young so different? I think - and this is speculation - that the way the young birds play and interact with one another reflects their very different lifestyles as adults. Turkey vultures, on the other hand, eat primarily dead food (they have been observed eating pumpkins), detectable by the smell of ethyl mercaptan. They don't need to stalk or hunt wary prey, although they do need to eat quickly to compete with other vultures and carrion eaters, including larger Black and King vultures. I don't know that carrion or hunks of carrion could be carried to the nest without falling apart: at any rate, Turkey vultures rely entirely on regurgitation. The young don't play with food much at all that we've seen: their parents regurgitate it, they eat it, and that settles it. As John Carton noted, the chicks learn to "gulp their food properly" in response to their parents' quick in and out feedings. Eating quickly is a necessary survival skill for turkey vultures, and they don't play with their food. 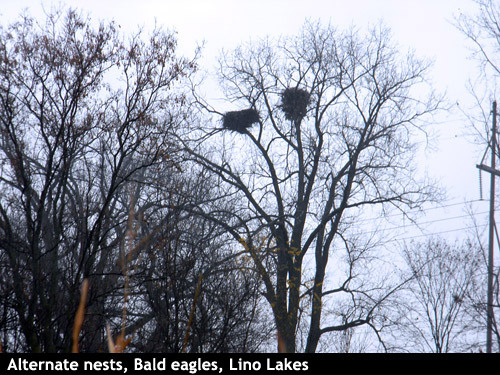 Eagles build huge nests, and the young eaglets mimic Mom and Dad's nest-building activity from a very early age. They move and place sticks and other nesting material, and play tug-of-war as well (perhaps preparing for the inevitable adult differences over where, exactly, that stick should go). Turkey vultures don't build nests the way that eagles do. In this case, the adults spent some time preparing the straw prior to egg-laying: they pecked at objects, snapped straw into smaller pieces, and formed a depression for their eggs. However, they invested very little time in maintaining, building, or caring for it once the eggs were laid. 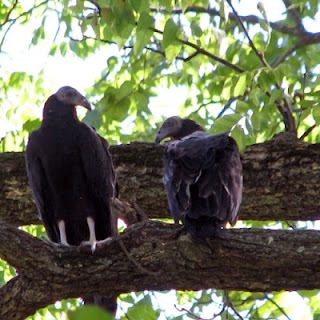 While the young turkey vultures roam around and explore objects, they don't engage in the same kind of stick and nesting material play that the eaglets do. In this case, no nest seems to equal no nesting play. Turkey vultures and Bald eagles are both social, and both sets of young spend a lot of time interacting with one another. When it comes to play, the eaglets tussle, cuddle, preen, steal food, and play tug of war. The young vultures (vulturelets?) beat each other relentessly, with occasional breaks for preening. While the eaglets appear to play at the complex skills of hunting, nest building, and competing for food, the young vultures appear to play primarily at competition, period. Although Turkey vultures are social, this behavior leads me to wonder about the intensity of TV to TV food competition. Is this all about other carrion eaters, or do adult Turkey vultures beat each other up over food as well? Although the behavior of the little Turkey vultures may not be as appealing as the eaglets to human watchers, their play and interaction is equally effective at helping to prepare them for the challenges of adult life. John predicts that they will most likely begin flying between August 28 and September 3rd. I've enjoyed watching them in the nest and look forward to his observations once they have left. 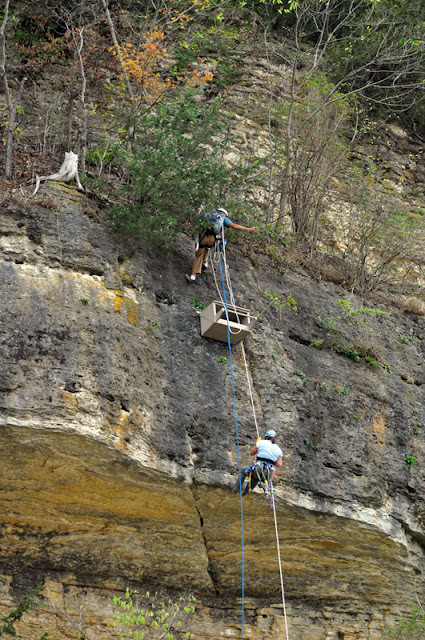 The Raptor Resource Project has purchased a transmitter and will be attempting to put it on one of the Decorah juvenile eagles later this year, once they are on wing. We've attempted to answer some of the questions we've received regarding transmitters below. The eagles we attach transmitters to are part of a larger longitudinal study investigating and documenting the lives of Bald eagles. We are learning a great deal about Bald eagle travel, wintering, and even socialization. However, our eagles are extra special because we know their place of origin. 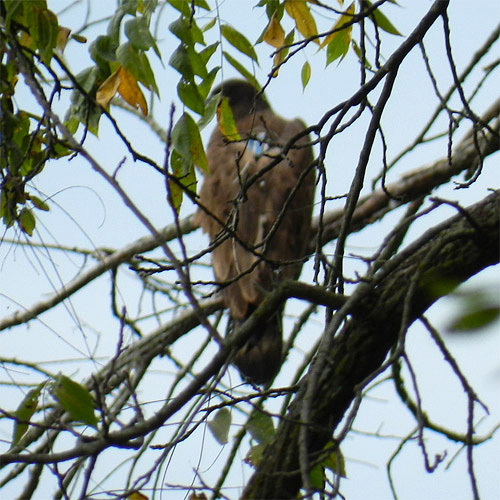 The rest of the birds our eagle biologist traps are juveniles or adults wintering along the Mississippi river. We think they may be from Canada, but don't know that for sure: many of them nest in Canada in the summer. We know where our eagles come from and we know their life histories, so their behavior will help illuminate the life histories of Bald eagles in general. So far, we know that D1 has a pronounced affinity for rivers, seems to enjoy the company of other eagles, and makes long flights. She didn't winter much further south than her place of origin, returned to Decorah (if not the fish hatchery) a number of times, and traveled north in the summer. While eagles are often associated with large rivers and magnificent landscapes (stony crags, snow capped mountains, mile-wide river canyons), D1 spent a great deal of time on small river systems that may seem less significant to us, but were very important to her. The preservation of river systems, even small ones, are clearly important to the health and survivability of Bald eagles long term. We may think we know a great deal about Bald eagles, but D1 (and her future study mates) are teaching us how much remains to be learned. The transmitter is yielding data on a part of their lives - what Bob sometimes calls the wandering years - that could not be studied otherwise. How do you know it doesn't bother the eagle? What about reproduction? When we first started talking about putting a transmitter on one of the Decorah eagles, we did a lot of research and talked with an eagle biologist we knew. 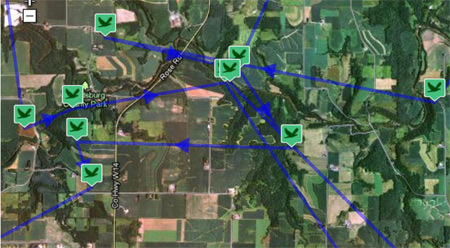 There are many ways transmitters can be attached to birds, and we wanted to make sure we used something with a good track record. Did it have a long history of use? Did the eagles studied have mortality rates significantly higher than what we know about Bald eagle mortality rates? Did eagles that died and were recovered show signs of damage or wear from the transmitter rig? Were we able to confirm that eagles wearing transmitters reproduced? In the end, we went with the backpack because it fit our criteria. Male and female eagles wearing it have been observed nesting and appear to live normal reproductive lives. Can we say for sure that D1 or any other eagle isn't bothered at all by the transmitter? No, we can't. Shortly after D1 was fitted, she seemed to do a little extra preening around her shoulders, where the backpack straps were located. This soon ceased, however, indicating that any discomfort was short-lived. Her parents didn't reject her, her siblings didn't reject her, and other eagles haven't rejected her. She flew long distances and survived her first year, indicating that the backpack didn't impede flight, feeding, or travel. What kind of trap will you use to catch the juvie? We'll most likely use a pan dam or noose trap again: a metal hoop with monofilament nooses that snare the eagle's legs. This method has been used for centuries by Eastern falconers, since it is easy to build, easy to set, and quite safe. 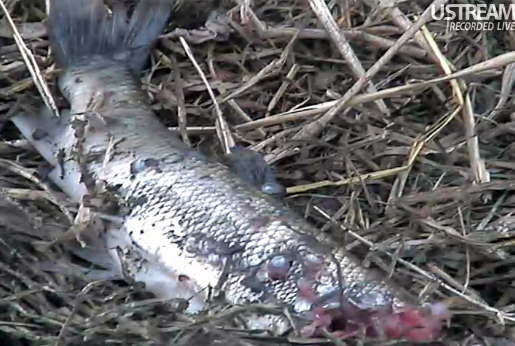 We lure the eagle into the trap, which is roughly the size of a hula hoop, with a dead fish or two. As it comes into the trap, the snares entangle its legs. There are no snapping or moving parts to this trap: the trap mechanisms (snares) are passive, so they do not spring or slam shut. We don't want the eagle to fly away with the trap still attached, so we tether the trap with a strong springy cord, which serves as both a stopper and shock absorber if the eagle does try to fly away. 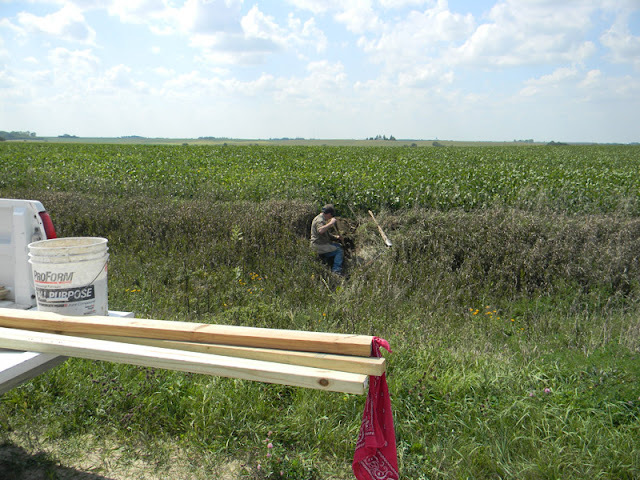 We conceal ourselves nearby so we can get to the trap very quickly once it is caught. Who makes the transmitter? Was it custom-made for RRP? It is a solar-powered PTT. We don't have a model number. Some things are custom - for example, we directed how often the PTT should cycle on and off to conserve battery life while collecting the data we need, and used an appropriately-sized and weighted rig for a large bird like a bald eagle. Other things, like the design of the PTT itself, are standard in every case. Here is a clip from last year of D1 with her transmitter on. We are using the same overall design this year. Will you use short and long range transmitters? We will. At this point, we are able to use one transmitter for both purposes, so the eagle will have one transmitter instead of two. Looking at the satellite data, it seems like it should be easy to find an eagle using long range only, but in our experience it is nearly impossible, especially when they are in heavy brush. How much does the transmitter weigh? The transmitter weighs 55 grams, which comes out to about 2 ounces. Iowa Bald eagles weigh roughly 8-12 pounds (we estimated 8-9 for Dad and 11-12 for Mom), so the transmitter weighs about 1.4% of an average male bald eagle's weight, and about 1.06% of an average female Bald eagle's weight. This is in accordance with the North American Banding Council's recommendation of 5% or less: indeed, it is well underneath the maximum. Take 8.5 pounds and multiply by 16 to convert to ounces. Take 136 and multiply by 28.3 to convert to grams. Divide 55 (the weight of the transmitter) by 3848 (body weight in grams) for the decimal ratio of transmitter weight to body weight. Multiply by 100. The transmitter is about 1.429 of an average male bald eagle's weight. Use 11.5 pounds for a for a female. How long is the antennae? The transmitter does not provide a path to ground for lightning. 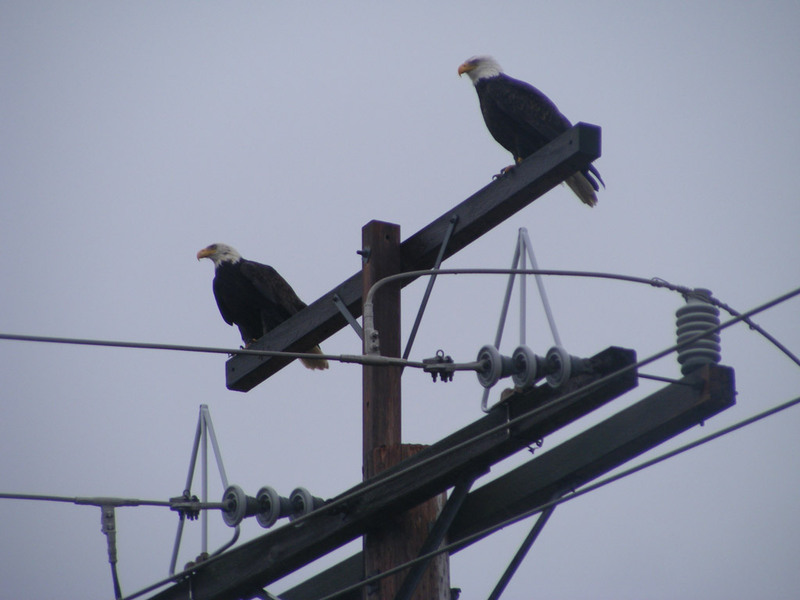 The transmitter does not change the eagle's electrical potential. 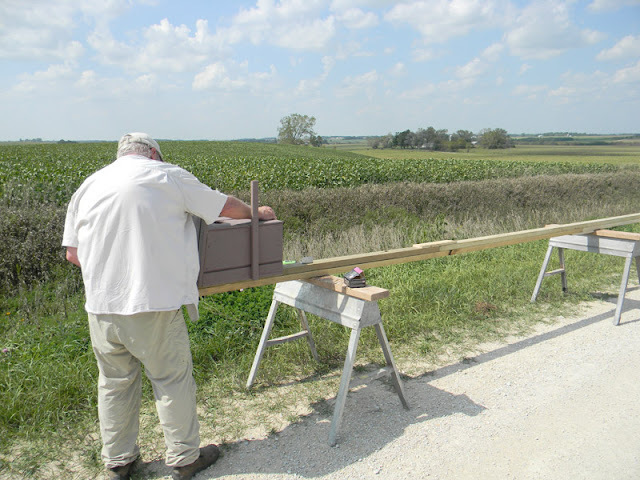 Lightning or grounding rods are taller than the things they are sitting on and provide a very firm connection to ground. Like water, electricity has to have somewhere to come from and somewhere to flow to. 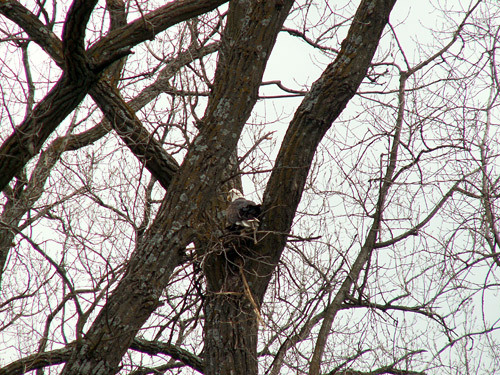 The trees that eagles roost, perch, and nest in are already very firmly connected to ground through their root systems: adding a 7.75 inch long antenna does not change the eagle or the tree's connection to ground, or the path by which electricity might travel to get there. When an eagle is flying, it isn't grounded, so the antenna (which isn't connected to ground in and of itself) provides no path to ground at all. How long will the transmitter last? We don't know for sure. Our transmitter are solar powered. Northstar's website lists the operational life as indefinite, but probably 2-4 years: our eagle biologist had one last as long as seven years. What's the transmitter back pack like? It is somewhat like a child's backpack. The teflon straps or ribbons go in front of and behind both wings, and are stitched together in the front. The straps are fitted snugly underneath the eagle's contour feathers, which prevents chafing and feather damage. We don't try to trap the eagles until they have been on wing for a few weeks, which assures that they have gained flying prowess and their flight muscles are fully developed. The final stitching of the harness allows us to custom-fit it to the individual eagle's body. Do a Google image search for 'eagle transmitter harness' or 'eagle transmitter backpack' for more images. The transmitter will not fall off. We did a great deal of research into transmitters and backpacks and worked closely with our eagle biologist to determine the best and safest type. He has had very good results with the system we are using now: eagles have carried them for a long time, traveled long distances, and reproduced with them. We decided we preferred a system that he knew worked and had data on over one we had no experience with. 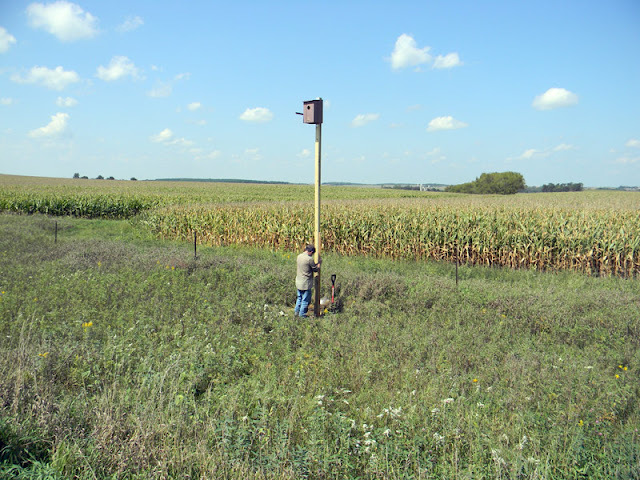 The North American Banding Council has established a code of ethics for bird banders, and we comply by it: http://avescr.org/Descargas/NABC/English/Raptor_Manual.PDF. Our Board and Director are all passionate about birds of prey: Bob Anderson has been involved in falconry since the late 1960s and bird conservation since the early 1970s. We believe that our study of bald eagles is not harming the study subjects in the short run, and will significantly benefit Bald eagles and other animals in the long run. 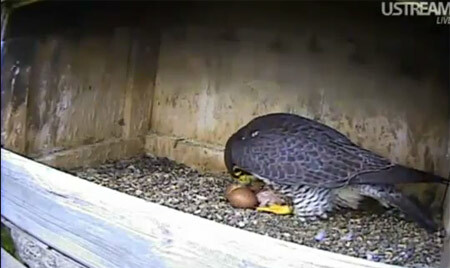 Michelle and Travis hatched two young falcons on 5/13/12, and the questions are already flying! I'll try to answer a few of the most common here. 1. Why are they nesting in gravel? I wish the hatchlings had grass or something softer! Historically, peregrine falcons nested in two places: on cliffs and in trees. To quote: "Although the peregrine falcon is currently considered a cliff-nester, records indicate that it once nested in tree cavities (Goss 1878, Ridgway 1889, Ganier 1932, Bellrose 1938, Spofford 1942, 1943, 1945, 1947, Peterson 1948). The peregrine still uses cavities in broken-off trunks in Europe (Hickey 1942), but the hole-nesting population of America apparently disappeared with the felling of the great trees on which they depended (Hickey and Anderson 1969)." Either way, peregrines did not build nests out of branches, twigs, or grasses. Cliff nesting birds use ledges or potholes. These commonly have some kind of substrate: sand, pebbles, dirt, and so on. The male and female dig and wiggle out a scrape, or shallow cavity, into which the female lays her eggs. 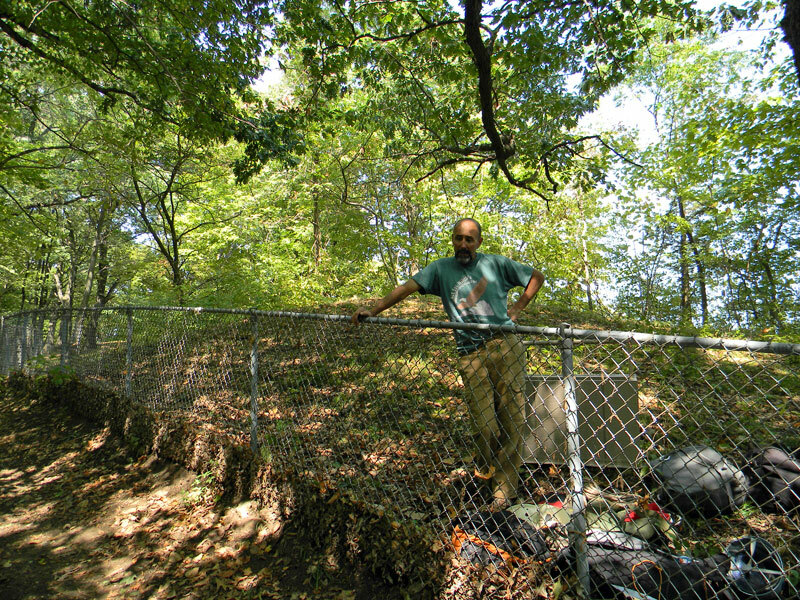 The substrate provides drainage, cups the eggs, and helps keep them from breaking on the edges of the underlying rock. We use 80 pounds of pea gravel in our nest boxes to simulate a substrate and protect the eggs. 2. How long can the babies go without eating? The hatchlings consume the egg yolk shortly before hatching, which gives them enough nutrition for 24 to 48 hours. However, they don't usually have to go very long. 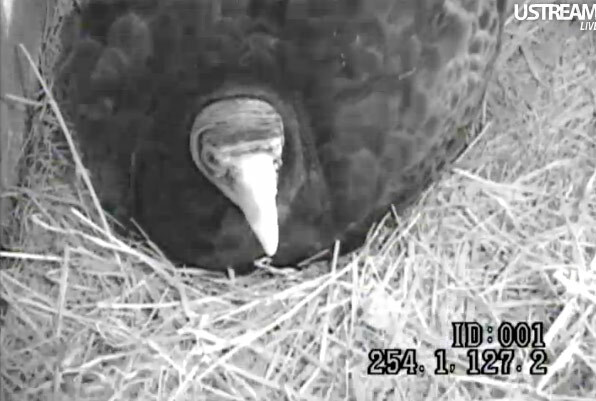 Their first feeding was at 11:49am CST this morning. 3. What do falcons eat? Falcons eat other birds. We've found the remains of pigeons, woodpeckers, coots, finches, blackbirds, ducks, cuckoos, and many other birds stashed in and around nests. In general, the adults catch a bird by diving or stooping on it. If the impact doesn't kill it, the adults use their tomial tooth - a notch in their beaks - to bite through their prey's cervical vertebrae. They pluck their prey prior to eating: "feather falls" have helped me locate Peregrine falcons at the Mayo Clinic and the Dairyland Alma power plant. Adult peregrine falcons eat about 2 1/2 ounces (70 grams) of food per day. Using a rough back-of-the-envelope calculation, males average 587 grams of weight and females average 1205. So males eat roughly 11% of their body weight each day. I'm guessing - and this is a guess - that females do the same, so Michelle probably eats a little more than Travis does. It has been speculated that gender-based size differences allow male and female birds of prey to eat from a slightly different prey bases, widening the available food supply. So based on this calculation, I'd need to eat about 16.5 pounds of food every day to keep up with Michelle. 4. How fast will the babies grow? Peregrine falcons double their birth weight in 6 days, and are 10 times hatch weight in three weeks. Like the eaglets, they start with a fluffy white coat of baby down. 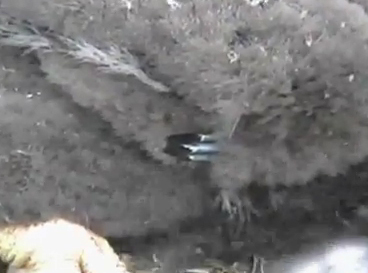 We'll start to see brown juvenile feathers emerging at about 20 days of age. By 40 days, the young birds will be sleek brown juvenile falcons. Over the next few weeks, we'll see a lot of eating, sleeping, and pooping. Poop is a great way to locate the nests and perches of many kinds or birds. See bird poop? Look around for the bird! 5. Will Cain and Abel Syndrome be a problem here?I don't want to say 'No', but I haven't seen it at any of the other Peregrine falcon nests we watch. There is an ample food supply and Michelle and Travis are very good at caring for their young. 6. Mom and Dad are talking to the babies! Yes, they are! We've already heard Michelle echupping encouragingly to her young immediately before their first feeding. We'll also hear the young food begging (which one website describes as 'screea screea screea'), and kakking: an alarm, defense, and 'annoyance' call. Peregrine falcons are very vocal. I've had unhappy babies set my ears to ringing more than once. 7. Does the nest smell bad? It depends! Some falcons are great housekeepers, while others (I'm looking at you, Hibbard plant falcons) let prey remains pile up in the nest. If the nest is messy, the young birds smell interesting to human banders - not bad, but not pleasant: a complex, spicy smell. Bob Anderson. He knows more about Peregrine falcons than anyone I know. I should see if he'd be willing to echup on video: it is really amazing. Any mistakes in this blog are mine, not his! http://redandthepeanut.blogspot.com/2012/02/notch-in-peregrine-falcons-beak.html (tomial tooth. Very nice photograph and drawing).